Fiber network overhaul provides transformational learning experience for students. Texas A&M University’s flagship campus is one of the largest in the nation, at over 5,200 acres. So, when it comes to the university’s underground fiber optic lines, there’s a lot of ground to cover. A lot of ground. Approximately 100 miles when added up. In fact, the data for the campus fiber optic lines had not been updated in decades. As a result, Texas A&M turned to the Department of Geography in the College of Geosciences to help bring the severely outdated system into the 21st Century. For the past year and half, a team of Geography students has worked to collect field data from the fiber cables across the entire campus. But the project didn’t exactly come together in a conventional way. “It was a random involvement,” explained Geography professor Dr. Dan Goldberg. Goldberg received a phishing email, which he forwarded to the Geosciences IT Director Paul Stine, who then sent it to the university-wide IT group led by Tom Golson. Once Golson saw the email signature and noticed Goldberg was in the Department of Geography, he asked if the professor would come talk with IT about the campus fiber dilemma. “Once we got down there I explained what GIS (Geographic Information Science) was and how we could potentially help solve their problem,” said Goldberg. Golson was very excited at the news, and immediately went to senior management and secured the funding necessary for the equipment and students to conduct the project. The experience was a valuable one for the students. "It's been rewarding to watch the undergrads go from having very little GIS and GPS field experience, to operating this equipment and learning what it's like in the real world,” said Andy Evans ­– a Geography PhD student, and the project lead. Everett Neucere, an undergrad in Geography, chose to participate in the project over taking a higher paying job because he knew the experience would be more worthwhile for his future. “I’m working on a project like this at an undergrad level, whereas many companies do these at a professional level. It’s given me experience to show other companies I’ve done this before,” he explained. The process of locating and mapping the fiber optic lines wasn’t an easy task. 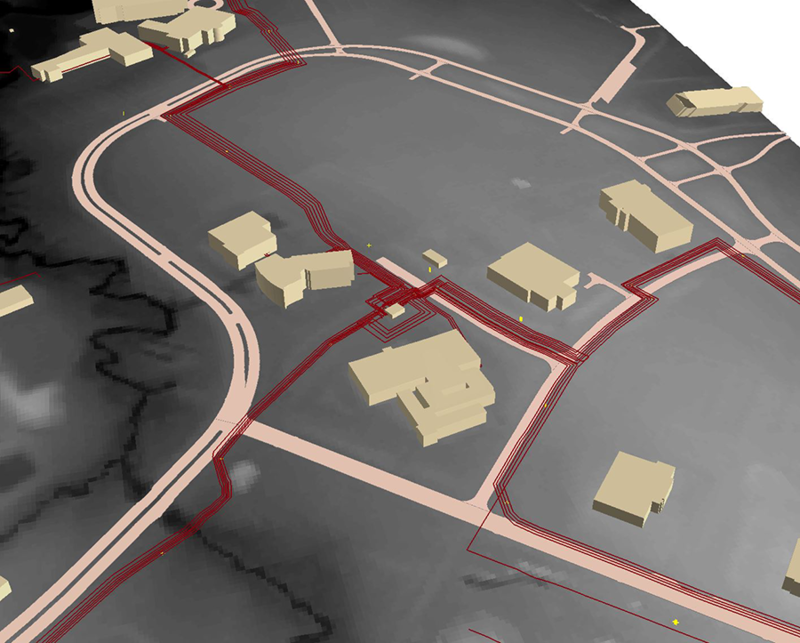 The team’s first step was using the original CAD data to locate every ground access port on campus and create a dotted map. “If you look around (campus) there are these square ‘man hole’ covers in the ground that say ‘electric’ or ‘fiber’. So, they open them up and get down inside,” explained Goldberg. Because of their underground locations, the students had to be prepared to pump out as much as 10 feet of runoff water – and even fend off snakes and other pests. Once the obstacles were removed, the students clipped into the underground fiber optic cables with a line finder. The team could then walk above ground with a piece of equipment that signaled to let them know when they were above the fiber line. One student would walk along to see where the device was beeping, a second student marked the location with red spray paint, and a third followed with a GPS tracker. “They would get all the data and bring it back to the lab, run some post-processing to clean it up, and load it into the databases that we’re using to store it,” said Goldberg. But the team didn’t just want to put together a rough map of the fiber lines, they wanted to provide Texas A&M with detailed information that could benefit the university for years to come. The new digital database will provide the university with a better understanding of the network’s capabilities and weaknesses. This is critical for maintaining and installing fiber lines. Unlike the previous system, data will now be easily shared with facilities, utilities, other campus departments ­– in addition to outside contractors working on new construction projects. “Now we can give them a tablet or usb drive with the data on it, and they can actually pull it up in real time,” explained Evans. “It will definitely help the university in the long run with future construction. It won’t involve digging out these papers from the 80’s to find out where a line went, that no one’s touched since then. They’ll receive a link on their phone and it will take just minutes,” said Neucere. “This helped me get an internship because the work I’m doing on this project, several companies are doing for government entities or other universities,” he added. Not only did the project bring Texas A&M’s fiber network up to date and save the university in future costs, it also provided a transformational learning experience for these students. The new digital database will provide the university with a better understanding of the network’s capabilities and weaknesses. This is critical for maintaining and installing fiber lines.